Shower pans with low curbs or no barriers will create a handicap shower environment. Adding slip resistant floors will also help in the safety of a shower. Handicap shower pans help to eliminate the need to step over the side of the tub or curb of a shower. This can be hard and even dangerous for some elderly and handicapped. Most companies offer a variety of style and sizes. Often there is a choice of low or standard thresholds. A standard threshold with an optional add on shower ramp works for most people who want to experience an accessible handicap shower. Ask what height curb the standard has and if you will need to have a collapsible water dam to use with it. On the other hand, you may find the best fit for you is the low threshold barrier free shower pans. The low threshold may require a collapsible water dam. The benefit is that there is practically no curb or barrier. Having no curb will create a handicap roll in shower that allows entry using a wheelchair. Different styles, shapes, and sizes are available. Some are the standard square shape and rectangular shape; while others can have their corners rounded or be more free-form and personalized. You can find these shower pans and shower bases in sizes ranging from 30”x 48” to 42”x 60”. For someone wanting to add a bit more durability and style, soapstone shower pans adds that extra beauty in a bathroom shower. 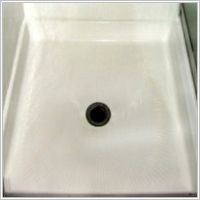 You can also have the choice of the drain hole being on the right, left or center. This is helpful if you are replacing an existing tub. They often come with a slip resistant shower base bottom. This makes them even safer for you and your family members. The many styles available have a wide range of prices. Depending on your insurance and disability, the price of the handicap shower pan may be fully or partially covered. Prices for handicap shower pans can sell for $300 to $700 for more customizable features. If these prices are too high, you can set up your own handicap shower or tub by purchasing a much more affordable shower bench or shower chair. For many it can make a difference between taking a shower on your own every day and paying for assistance. The freedom of being able to get into the shower with little to no help will put a smile on your face. Putting a handicap shower pan into your bathroom can add comfort and beauty to your home.